Delighted to announce I’ll be doing an author talk at 6:30 PM on Tuesday, March 5 at the Shepherd Park (Juanita E. Thornton) Library in Washington, DC. It’s an honor to be the first crime fiction writer the library has featured in the series and to be highlighted during Women’s History Month. Happy to announce I’m one of the writers participating in a giveaway for readers of romantic suspense, mysteries, and thrillers. Enter from March 13-31 and you could win a Kindle Fire HD8, Kindle Fire 7, or Amazon gift card. Other prizes include four eBook prize packs. 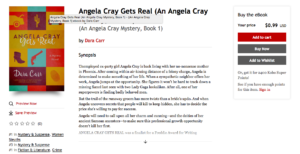 During the promotion, ANGELA CRAY GETS REAL is on sale for .99 cents! 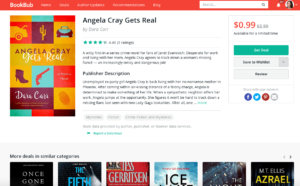 Sale prices are available for books by the other authors participating as well. Check out the promotional book fair! Happy to announce that my story, “Off-Off-Off Broadway” is available in the March/April issue of Alfred Hitchcock’s Mystery Magazine. This is my first appearance in the magazine so I’m especially pleased. And, sigh, between submission times and a number of twists and turns in revising the piece, it has taken literally years for this story to reach print. Subscriptions are available at Alfred Hitchcock’s Mystery Magazine. Single copies of the March/April 2018 issue are for sale on Amazon: http://a.co/hCrl9BL. Many thanks to IndieReader and reviewer Chaz Baker.